Dr. Kimberlee Barnhart always knew growing up that she wanted to be a doctor and work with children. Originally, she pictured herself serving in the medical field as a pediatrician and pursued an undergraduate degree with this goal in mind. She graduated pre-med from Baylor University in 2012 with a Bachelor’s of Science degree in Biology. However, towards the end of her studies she realized that the route of traditional medicine might not be right for her at the time. It was while working in a medical office following her undergraduate studies that Dr. Kimber experienced a minor back injury that brought her into a chiropractic office for the first time. The improvements made in her pain and her life opened her eyes to the potential benefits that holistic care could offer people, and she began exploring the chiropractic profession. 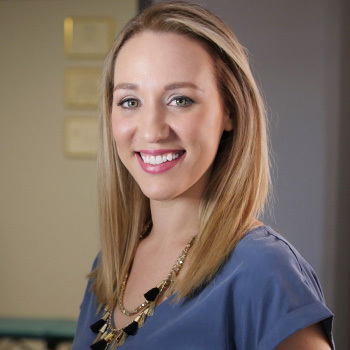 Her pursuit of a chiropractic education brought Dr. Kimber to the Houston area. She attended Texas Chiropractic College in Pasadena and recently graduated with a Doctorate of Chiropractic. Dr. Kimber is board certified by the Texas Board of Chiropractic Examiners. In addition to the standard chiropractic curriculum, she also pursued more extensive individual training with the International Chiropractic Pediatric Association (ICPA), earning over 200 additional hours of specialization in pediatrics and pregnancy. Dr. Kimber is Webster Technique certified, which allows her to provide the best care for pregnant women. Most impressively, she is currently completing two research projects in order to fulfill the final requirement of becoming certified by the Academy Council of Chiropractic Pediatrics. During her time in chiropractic school, Dr. Kimber completed rotations at Rice University, caring for football athletes, and at The Bridge Over Troubled Waters, providing chiropractic care in a women’s and children’s shelter. One of her most unique memories includes traveling to the Dominican Republic on a mission trip, providing all-natural chiropractic care to underserved communities. Dr. Kimber is a member of the Texas Chiropractic Association, American Chiropractic Association, and the International Chiropractic Pediatric Association. Dr. Kimber is originally from Flower Mound, Texas. However, she loved Houston so much that, after completing school, she decided to stay! When she is not in the office she loves to spend time with friends and family, especially her beloved Yorkie pup, Reese! Dr. Kimber enjoys watching sports and cheering on her Baylor Bears (sic’em!) and the local Houston Astros. She also enjoys exploring new local restaurants, scrapbooking, and participating in spin classes for exercise. She is proud to invest in the Houston community and was overjoyed to open her new practice in charming Old Katy! Contact Hartland Chiropractic & Wellness today to schedule your first appointment with Dr. Kimber! Same-day visits are available, and walk-ins are welcome to stop by.